Last year, Alison was moving with her family from Tokyo, Japan to the DC area. They chose schools for the kids, and even narrowed down their search to a couple of neighborhoods. Now the only thing left was to figure out how Alison and her husband, James, would get to work. 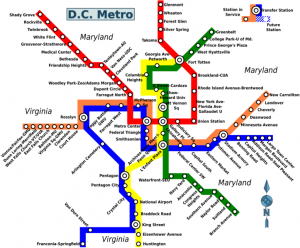 Metro is the subway system that connects DC with its suburbs. The orange line connects downtown DC with Vienna, Virginia (right around the middle of Fairfax County). The yellow line connects the southern part of DC with Alexandria, VA. The new line (currently called “Silver”) will connect Tysons Corner and, eventually, the Dulles Airport with Washington, DC via rail. As you can see, the Metro reaches far into Fairfax County, but the County is quite large, and sometimes riding the a bus is a better choice. There are plenty of bus options in Fairfax County. The best way to figure out the best route is to use the Washington Metropolitan Area Transit Authority’s (WMATA) Trip Planner. This trip planner can also include DC Metro rail as an option for part or all of the trip. The Fredericksburg line leaves from Union Station and links the southern part of Fairfax County all the way to Lorton, going through Springfield. This line continues south to Fredericksburg, VA (not in Fairfax County). The Manassas line also leaves from Union Station, and it links some of the western parts of Fairfax County: Burke and Springfield ,and it continues west toward Manassas, VA (in Prince William County). If rail and bus aren’t the best options for commuting, driving a car is another option. Interstate I-95 and I-395 – if coming from the southern part of Fairfax County, these are the main arteries to get into the city. Route I-66 – Coming to DC from the west, I-66 is the most direct route but one must watch for High Occupancy Vehicle (HOV-2) restricted times for the section of I-66 that is inside the Beltway. An alternative to I-66 is Route 50. Interstate I-495 – Also called “The Beltway”, it goes around DC. From it, one can take an exit out of it to go toward the city. One thing to keep in mind if one chooses to drive a car is that traffic can be pretty heavy especially during rush hour. A good way to make driving a little easier is to carpool. With carpooling, two or more people share the same car when going into or out of the city. This helps with being able to use the High Occupancy Vehicle HOV-2 (or HOV-3) lanes and saving some driving time. There are many carpooling arrangements, and one of the most interesting ones is called “slugging”. There are slugging lines at certain locations mostly on the southern suburbs of Fairfax County (in Springfield, VA). On these lines, drivers pull up with a destination sign, and hopeful sluggers stand waiting for a car going to their destination. If your commute to DC is short, or you are very fit (or hoping to be), you could bike to work. There are several trails along Fairfax County that host bikers on their way to work. Mostly, these trails connect locations within Fairfax County. If you are very fit (or looking to be), you could ride the trails from Fairfax County through Arlington County and into DC. 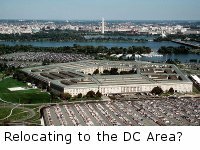 However, if you live on the western-end of Fairfax County and you don’t need to commute to DC, but rather to another employment area, you could also bike to work. For example, getting to Reston, VA from the East could be accomplished by riding on the W&OD trail. Or, from the South, one could ride along the Fairfax County Parkway. But what if biking to work was just a bit too hard to do? Then, you could always mix and match how you get to work. You don’t have to stick to just one way of transportation when choosing your commute to DC. In Fairfax County, you could ride your bike to a bus stop and then take the bus into work. You can even take your bike on the Metro. If biking isn’t for you, then you could drive to one of the park n’ride bus stops, then take a bus to the metro station, and ride the Metro all the way into the city. As you can see, the possibilities are plentiful. It’s simply a matter of figuring out what’s best for you, and then enjoying your daily commute. In the end, Alison and James each chose their preferred method for getting to work based on where they accepted their new jobs and in the neighborhood where they chose to live. Click for a downloadable PDF of the 7 Tips on Transportation in Fairfax VA WITH links to external resources about each of the tips that we mentioned.